As we all know advertisement is essential to grow any business. You have to reach out to the potential customers first. Later your business may run on recommendations. If I will ask you what are the places where you can advertise for maximum benefit? I am sure many of you may come up with two or three places like Google, Yahoo or few more. But do you know there are plenty of places available online where you can promote your business effectively? Also, one thing you should not that not every advertising method works for all business. So you should have a good number of alternatives in order to handle any situation. 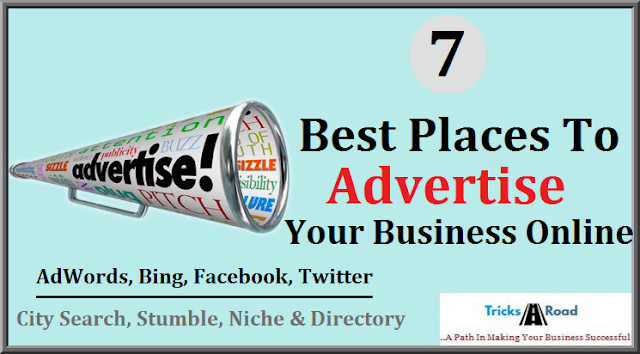 So today I am going to talk about 7 best places where you can advertise your business online for maximum benefits. One of the recent surveys on online advertisement has shown that global display advertising is growing by more than 36% each year and this is the best way to reach out to your potential customers. Also, many of the below companies offer few FREE credits for new customers. So you can just do bit search and you will get free credit initially. Later if that advertising platform worked for you, continue with that else switch to other. But give some time to understand the model before switching to another platform. No doubt Adwords is one of the best and widely used online advertising companies owned by Google. As Google own majority of the search engine market so advertising on such a great platform will be very beneficial for all. Adwords worked on PPC (pay per click) model and you have to pay once someone will click on your ad. The price varies depending on various factors like keywords, Location, Audiences and much more that you are targeting. One click may cost you even $0.01 or it can also cost you $400. So it totally depends on the niche, Target Audience, and Locations. They provide different types of advertisement solutions like Text Ad, Display Ad etc. Setting up a campaign is not that difficult in Adwords you can do in 5 minutes also. The one thing that you should take care is the Keywords. Select the best keyword that describes you and can earn you maximum benefits. Microsoft AdCenter uses their search engine, Bing, to display advertisement. Bing is the 3rd largest search engines after Google, YouTube (again a Google Company) and is very famous in the US. Here also you have almost all the features of Adwords. The benefit that you will get in Bing is less cost. For the similar campaign, you will feel less cost compared to Adwords and so you have to invest less money. The biggest social media giants Facebook also advertise different brands and business and are gaining lots of popularity these days. Facebook can be the best advertising solution for small business owner. Their advertising system is also somewhat similar to the above two but the mega benefit that you will receive here is you can even display an image along with the text. So even people are not clicking on your ad, still, you get lots of exposure. Twitter is also one of the best ways to advertise. There are 143,199 tweets per second are getting tweeted on Twitter. So you can estimate their large audience. Twitter mainly promotes profiles, tweets, and hashtags. But now they have also started other advertising platform. So it can also be one of the media to promote your business online. CitySearch does not have their own search engine but they have an association with many major search engines where they promote your business. They manage your daily result and do ad placement on MSN, Google, Yahoo etc. The idea is again the same PPC. They offer two paid plans- The Web connect and Call connects. This is still unknown to most of the people but Stumble upon is one of the best and very economic advertising solutions. Stumble Upon has an advertising platform known as Paid Discovery where you have to spend somewhere between 0.05 cents to 0.25 cents. You can see how economical it is. They charge you when someone stumbles your ad. I personally love this network. If you are targeting to potential customers from some particular niche then advertising on niche blogs can be the best idea. You can ask the admins to either write a review about your business/products or you can do banner advertisements as well. This is one of the most effective means of reaching out to targeted audience. Even they charge very less compared to other big advertising companies. if you want to advertise on our blog TricksRoad, just shoot us a mail. The online directory is also a good way for promotion. There you can either do free promotion or paid promotion. if you are going for free then depending upon the review they display any profile at top while in paid, you can get the top slots. This is very effective way of promotion as even in paid advertisement you have to pay somewhere around $2-$30 per month depending on the directory. So even a low budget companies can do advertisement on these directories. I can certainly tell that online advertising works great. I am an internet marketer and from the above list I have personally advertised on many platforms and some of those have given a great result for me. So if I can get the result why not you? Do try today itself and let me know your success stories. Also if you are facing any issue do let me know in comments. I will definitely help you to get out of it. You can even shoot me a mail and can be assured for the solution.